Dinner at home to mark the start of the Year of the Rabbit: lotus root salad and preserved duck eggs to start; then Cantonese steamed sea bass (年年有余), Sichuanese red-braised wild rabbit, garlic stems with shiitake mushrooms, Shanghai-style braised water bamboo, Dongpo pork, Shanghai green pak choy with quail egg ‘rabbits’. 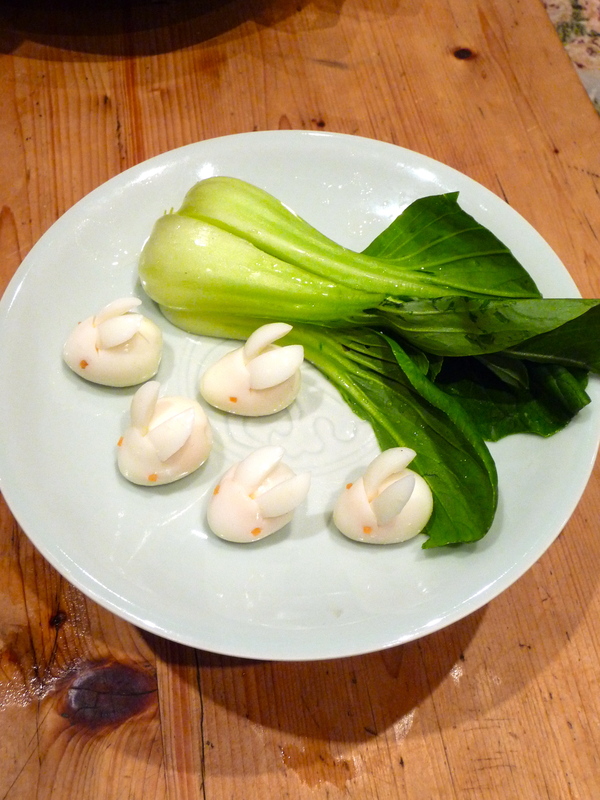 The picture on the left shows the quail egg ‘rabbits’ before the meal. Aren’t they sweet! sorry to post again. just realised it’s 茭白. Where did you get it from? Can you get 茭白in the UK? Water bamboo is known either as 茭白 or 篙笋 (I think that’s the right gao). Yes, you can get it in the UK, but not all the time. I bought some on Tuesday in Chinatown. Absolutely delicious. I am jealous! Never seen it in Manchester Chinatown. The quail egg rabbits are adorable. They look pretty straightforward to assemble, though your ears looks so nicely perky! Any tips? Did you use bits of the yolk from ear egg to make the eyes? The eyes are made from tiny sticks of carrot! Can you recommend a source for purchasing seeds to grow some of the chinese vegetables you have mentioned on your blog? How lovely – those rabbits are adorable. How do you make your lotus root salad, do you use sesame oil? How is the rabbit prepared? I’ve got one in the freezer waiting for a good recipe. Lindsay Mico: I’m afraid I don’t know where you can get the seeds. Of course they are widely available in China, but I imagine there is a lot of complicated bureaucracy involved in importing them and selling them over here. Helena: I blanched the lotus root and tossed it with a little wood ear fungus, some dried shrimps, some fresh red chilli, chopped ginger, rice vinegar, sugar, salt and spring onion. I don’t think I added any sesame oil. I was trying to imitate the one they serve at Barshu. Evan: I cooked the rabbit along similar lines to the red-braised beef in my Sichuan cookbook. BUT, because rabbit can have a strong, gamey taste, I began by blanching it, rinsing it thoroughly, and then marinating it in Shaoxing wine, ginger and spring onion (discarding the juices before cooking). It ended up tasting very clean and delicious. I’ll probably publish the exact recipe in my next book! I found a good website that sells a variety of oriental veg seeds.